Whether you’re replacing your shower head for aesthetic purposes or because you have a leaky shower head, the task is a relatively simple one. There are a lot of articles out there that will guide you through this process, but this article offers some tips to make the process even more effortless. A low flow shower head will save you a lot of water over time. Today’s models have been re-engineered to perform like a full-flow shower head. Here is a list of tools and supplies you will need to complete the task: teflon tape, painter’s tape and an old cloth. You may need a flathead screwdriver and channel lock pliers if you’re having difficulty removing the screws by hand. You may need a wrench during installation. Once you’ve removed the shower arm, assess the quality of the putty on the threading of the shower arm. If it’s not uniform, you will have to reapply it. This will prevent any water from leaking out of your new shower head. However, instead of using putty, use teflon tape—it’s much less messy. Inspect the tiles around the top of the previous showerhead, looking for cracks and leaks. Replace the tiles as necessary. When you’re installing the new shower arm, put painter’s tape around it to prevent your tools from scratching the finish on your new shower head. You can also use a cloth or rag. 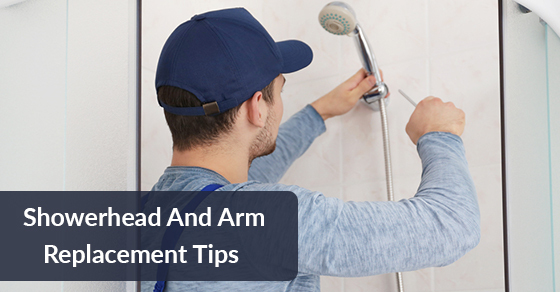 There are two ways to replace the shower head and arm, but you will save time if you place the shower head into the arm before installing the arm into the wall, as opposed to doing these tasks separately. Also, ensure that you don’t over tighten. If you notice leaks after testing your shower head, remove it and then tape the threads again. Then, re-install the shower head. Repeat until you don’t find any more leaks. If this doesn’t solve the problem, you will need to look into professional plumbing services. If you are in need of first rate professional plumbing services, contact our team of experts at Brothers Plumbing today. We are one of Toronto’s leading plumbing providers, with over 50 years in the industry, and offer affordable rates.